The following seniors have won Chemistry Awards, and will be recognized at this year’s Chemistry Diploma Ceremony, on May 21, 2017. The Dr. E.W. & Maude V. Flagg Award is being awarded to Lauren Bolz. This award recognizes outstanding performance and promise in chemistry by a graduating senior. The recipient is selected by a faculty committee appointed by the Chair of the Department of Chemistry. The award consists of a certificate and cash prize. The 2017 John McCreary Memorial Prize is being awarded to Gavin Piester. The John McCreary Memorial Fund was established in 1985 in tribute to the high academic and scientific standards and the personal dedication of John James McCreary. The award consists of a certificate and cash prize. 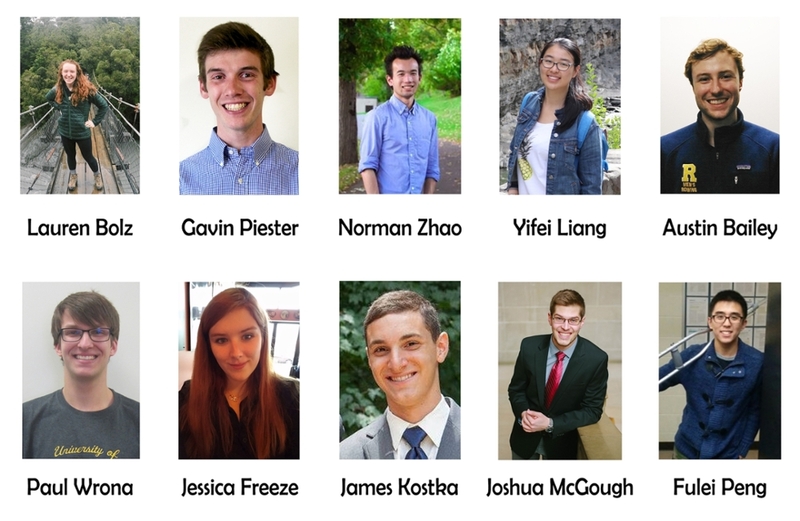 The American Chemical Society (ACS) Awards are given to selected students based on outstanding academic record and academic achievement in specific fields of chemistry. Recipients receive a certificate, a cash prize and listing on the ACS website. - The ACS Inorganic Chemistry Award is being awarded to Norman Zhao. - The ACS Organic Chemistry Award is being awarded to Yifei Liang. - The ACS Physical Chemistry Award is being awarded to Austin Bailey. - The ACS Rochester Section Award is being awarded to Paul Wrona, and he will also be recognized during the ACS Annual Rochester Section Undergraduate Research Symposium. The Carl A. Whiteman Jr. Teaching Award recognizes exemplary teaching by an undergraduate student in the Department of Chemistry. Carl Whiteman graduated from the University of Rochester in 1950 and worked continuously in the Department until his retirement in 1986. This award recognizes his teaching experience, as well as that of the recipients. This year, this award is being awarded to Austin Bailey, Lauren Bolz, Jessica Freeze, James Kostka, and Paul Wrona. Recipients receive a certificate and cash prize. The 2017 Chemistry Department Awards are being given to Joshua McGough and Fulei Peng. The Chemistry Department Award is given to seniors in recognition of outstanding scholarship in the study of chemistry. Recipients receive a certificate and cash prize.